Nike SB Dunk Low‘s “Day of the Dead” colorway will soon adorn the beloved Kyrie 4 silhouette thanks to Nike Basketball. There’s no question that Kyrie Irving is a quiet sneakerhead with previous colorways such as the “Cereal” pack alongside a General Mills collaboration that resulted in three cereal-inspired editions (Lucky Charms, Cinnamon Toast Crunch, and Kix) as well as the Nike SB-influenced “Green Lobster” version of the basketball shoe. 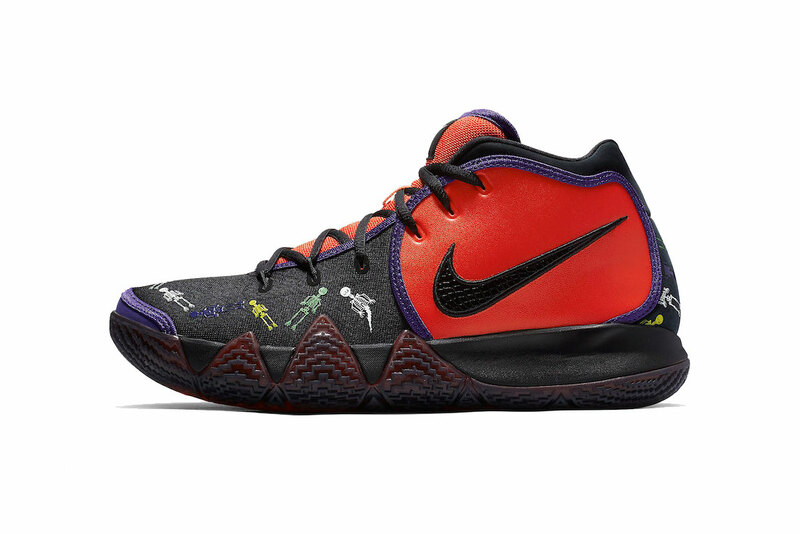 Today, Irving digs into the SB crates once more with a special “Day of the Dead” colorway. Bright orange is joined by black and purple – similar to the 2006 release – along with skeleton graphics spread throughout the toe area, heel and insoles. The design also features a semi-translucent outsole sporting a black to orange transition along with mismatched logos on the tongue. The Nike Kyrie 4 “Day of the Dead” will retail for $120 USD and will launch overseas on October 30 with a global launch to follow on November 1 at select Nike Basketball retailers and Nike.com. The model was recently wrapped in a Halloween theme.